Let’s Play: Ancient Greek Punishment: Inversion Edition is a browser-based game where you play not as the punished, but the punisher. It puts you in the perspective of a god, an inscrutable being of unimaginable power, and then lets you marvel in how unsatisfying that experience must be. Greek mythology is littered with stories of people punished in cruel and ironic ways. Orpheus would have been able to leave the underworld with Eurydice had he not looked back at her—but after all he’d been through, who wouldn’t have? Icarus flew too close to the sun on wings made of wax, and then fell. 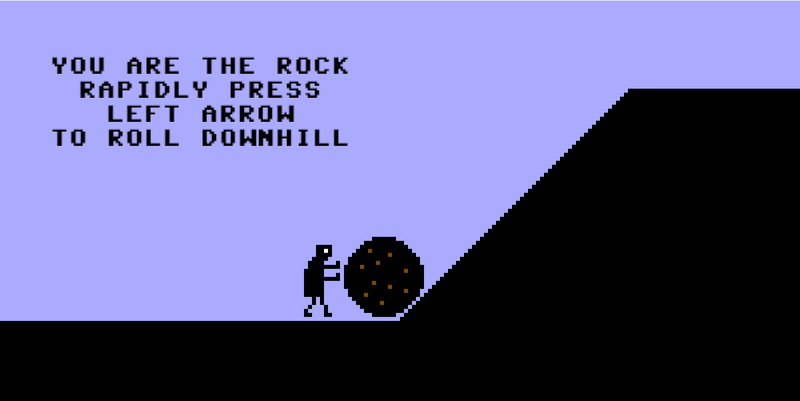 Ancient Greek Punishment: Inversion Edition takes the player through some familiar myths, like Sisyphus and Prometheus, though in this case, you’re the boulder and the pecking crow, rather than the men. Pippin Barr, who developed this game, has explored these specific myths before in games. He released Let’s Play: Ancient Greek Punishment in 2011, which was a straightforward take on the myths—you try to roll the boulder up the hill but never manage to make it to the top. Barr has since made an Art Edition, Limited Edition, and CPU Edition of the game, each riffing on the same five myths of Sisyphus, Tantalus, Prometheus, Danaids and Zeno. Inverse Edition takes it back to basics. Where Limited Edition had you kind of escaping the confines of the punishments, with Sisyphus able to finally roll that boulder up a hill and Tantalus finally able to eat the fruit on the branch above him, Inversion Edition has you play as the boulder and the fruit, rolling back down or raising your branch out of the grasp of desperate fingers. The goal is to keep these people failing, to make sure they stay punished. The tedium makes me think about the nature of torture. How much would I have to hate someone to keep them confined to an extremely dull torture scenario for all of time? Making sure Sisyphus can’t reach the top of that hill is boring. I keep thinking about the extreme pettiness of the Greek gods, having to check up on Prometheus a couple times a day to make sure his liver is still getting pecked at. Ancient Greek Punishment: Inverse Edition is a new look at the Greek gods. It’s worth a play to understand that spin on Greek myths, or even just to learn where the word “tantalize” comes from.